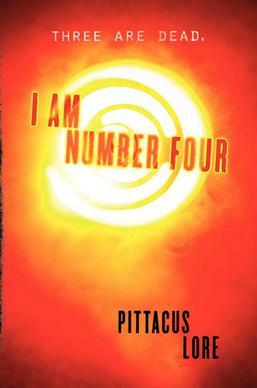 I just finished reading I am Number Four by Pittacus Lore. It rhymes!! 😄 (Four, Lore. 😜) Anyways, I did enjoy this book, but not as much as I thought I would've. I definitely thought it was fantastic, but I was expecting it to be out of this world! Awhile ago, a friend told me that I am Number Four was absolutely fantastically amazing. Therefore, I had really high expectations. When I was looking around the library, I spotted it and decided to read it. Even though it wasn't what I expected, I'm still really glad I read it. They started off as a planet called the Lorien. There were many of them and they were at peace. Now only nine remain, along with their guardians, a total of 18 all together. They are losing hope. The Mogdorians, an evil alien species, is getting closer to finding them everyday. They have one goal -- to kill all the Lorien species remaining on earth. There is one problem. These species have been protected in the way that they must be killed in the right order. The Mogdorians know this. Already, three have been killed. Number Four is next. I am Number Four combines love, loss, anger, forgiveness, bravery, adventure, lies and so much more. I liked the characters, though I felt like it took awhile to get to know them and when unpleasant things happened to them it didn't upset me as much as other book characters have. All in all, I really did like Number Four (aka John) because of his persistence. I really like how he tried his best to protect the people he loved. Henri and Sarah seemed to be his major motivations. What I really liked about this book was the different alien races, how we learned about them and how Pittacus Lore brought them to life. Immediately, we know that the Mogdorians are an evil alien species attacking John and his kind, who we later learn are from Lorien. I have to say, a saw a few of the plot twists that were coming, but some of them surprised me entirely! SPOLER ALERT SKIP TO NEXT PARAGRAPH. For example, at the beginning, when John was describing the deer and their dark eyes, I was sure that they were Mogdorians who were secretly watching him, without him knowing. Then, when he met Bernie Kosar, I was sure that he was also a Mogdorian who could shape shift. Then, I was 93% sure that Bernie was a Mogdorian when he ran into the woods every time he went out with John and then would re-appear ahead of him or on the other side of the forest. I was appalled when John didn't seem to find this strange or out of the ordinary. I thought that he would have suspected that something was up. But then, I was wrong. I usually don't like admitting it, but it's true. 😒 It turned out that Bernie Kosar was actually from Lorien! That's why he seemed a tad strange. Phew! I've been meaning to read this series for years, but I still haven't gotten around to buying it. Same! I actually was thinking of starting them a year ago, and finally started now. The first book was pretty good, so I'm planning on reading the rest of the series.